Rising redshirt sophomore Colby Reeder is one of many names to watch this spring for the Blue Hens. Delaware Baseball is 14-14 overall and 3-3 in conference play at just about halfway mark of the season. What needs to happen for the team to repeat as CAA Champions? Teddy Gelman: Last season Manager Jim Sherman’s team batted .310, which led to 613 hits and 422 runs. At the halfway mark this season, the Blue Hens are batting just .233 with 206 hits and 113 runs. Delaware’s pitching staff has posted similar numbers this season, so, down the stretch, the offense needs to get going for this team to have a shot in the CAA tournament. Brandon Holveck: All that the Blue Hens need to worry about is punching their ticket to the tournament. Last year, Delaware entered the six-team CAA tournament as the fourth seed, then reeled off four straight victories to win the conference. Despite their mediocre first half play, the Blue Hens are in the same spot — fourth in the CAA. In a single elimination baseball tournament, anything can happen. Delaware has just as good a chance as anyone to get hot at the right time. Call it May madness. Tye Richmond: The team currently sits fourth in the standings, the same position as it did last year before going on a magical run to capture its first CAA Baseball title. But last year’s championship team led the CAA in batting average and ERA. So in order for the team to repeat that, bats and arms need to get hot. Dan Rosenfield: They need to stop giving games away. Too many times this year, they have gotten blown out even at home. They have beaten some tough competition, with two wins against Big Ten powerhouse Maryland, but need to become more consistent, especially in the bullpen. Which Delaware Football player could make an unexpected impact next fall, that fans should keep an eye on this spring? Teddy Gelman: Wide receiver Thyrick Pitts. The rising sophomore is one of the most athletic receivers on Delaware’s roster. Listed at 6’2’’, Pitts played in all 11 games last season and despite not recording a catch, he should provide a solid receiving option for whoever the Blue Hens start at quarterback next season, especially with No. 2 receiver Diante Cherry no longer on the roster. Hannah Trader: Sal Mauro is a player to keep an eye on this spring and next season. He had a strong spring camp last year, but Cam Kitchen was picked to start over him. He still didn’t come off the bench when Kitchen was injured for the season. However, with major defensive contributors gone, Mauro will have to be looked to. He played with the first team and won most improved in last year’s spring camp. 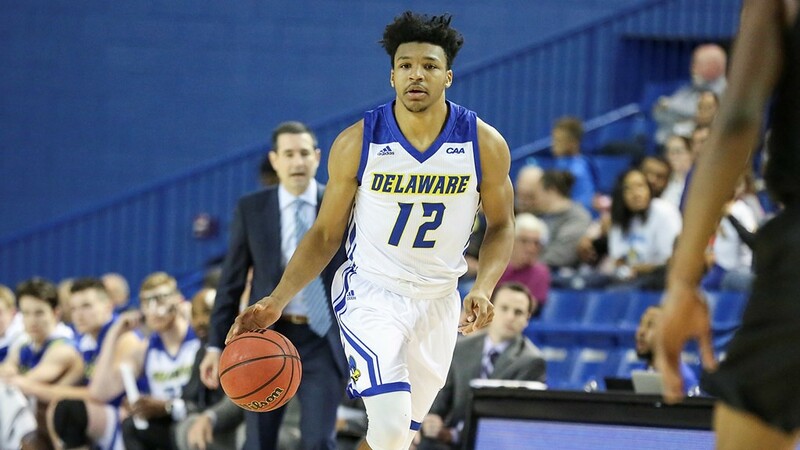 He may not have gotten the chance to show what he can do against opponents yet, but if he can take what he has done in practice to games, he will help take Delaware’s already stout defense to the next level. Daniel Zaborsky: Sophomore offensive lineman David “Big Country” Kroll. As a true freshman, Kroll saw action in 10 games where he was featured as an extra blocker in a variety of different packages. With a 6’6”, 315 lb frame, Kroll is a prototype tackle who’s only getting stronger with the help of the Blue Hens strength and conditioning staff. With the departure of all-CAA offensive lineman Jake Trump, a hole opens up at tackle: a hole Kroll is ready to fill. Tye Richmond: Linebacker Colby Reeder, as a redshirt sophomore, played in all 11 games and started all but one of them. He was also named the ECAC All-East Defensive Rookie of the Year and CAA Defensive Rookie of the Year. Reeder ranked seventh on the team in tackles with 49, but ranked fourth in solo tackles with 28 and recorded four or more solo tackles on four separate occasions. Now, with bigger role on the defense, he is in line to have a breakout year. Which spring sport’s conference championship are you most excited for? Brandon Holveck: Women’s track and field. 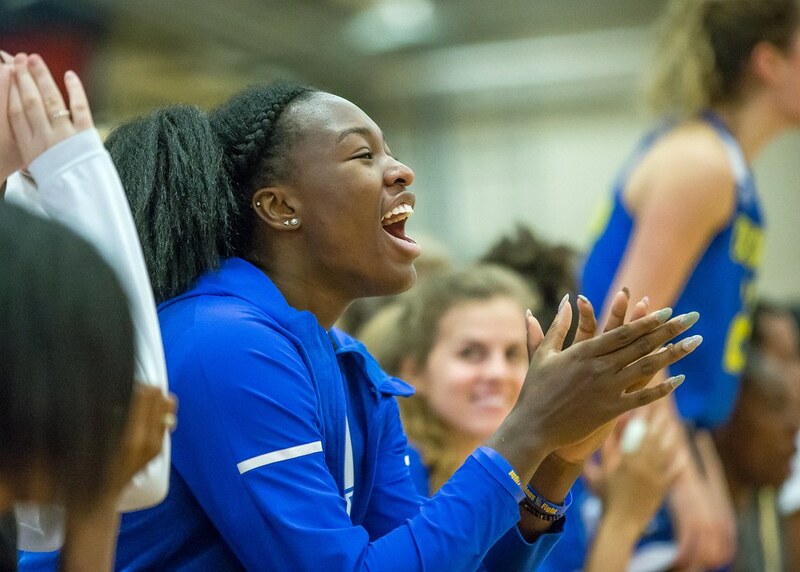 The Blue Hens are holding their own at some of the east coast’s top invitationals, including the Colonial Relays at William & Mary, where they bested 41 other squads for the team title this past weekend. At the CAA Championships the first weekend in May, Delaware should have multiple individual standouts, including pole vaulter Ashley Bailey and middle distance runner Liz McGroarty. Bailey broke the school record at the Colonial Relays with a vault of 4.00m (13-1.5). McGroarty could graduate as the record holder at three distances: 800 meters (currently second all-time, 2:08.74), 1500 meters (currently third, 4:23.52) and 3000 meters (currently second, 9:42.24). Collectively, Delaware will be vying for their first CAA team championship since 2014. Last year, Delaware placed fourth out of eight teams. Hannah Trader: I’m most excited for the men’s lacrosse conference championship. So far in Delaware’s conference games, they lost by one point to Massachusetts – first in the CAA right now – and beat Farfield. They still have to play Hofstra, Towson and Drexel. Delaware is third right now in the CAA with Hofstra right above them at second. This is Delaware’s first season with new Head Coach Ben DeLuca who has already made some progress from winning no in conference games last season, to already having one CAA win under the team’s belt. Daniel Zaborsky: Baseball. After their breakout party in last year’s tournament, expectations have obviously risen for the squad. After a slow 14-14 start, the team hasn’t necessarily lived up to these expectations, but still sit fourth in the CAA, a prime position for them to make their move in the conference during the second half. Considering the amount of talent on this team, the bats are bound to wake up at some point. If this team peaks at the right time, they can attack tournament hot and recapture the magic of last year’s Cinderella run. Tye Richmond: Men’s Lacrosse. The team gave the conference leading Massachusetts Minutemen a good fight — only losing by one point. As it stands now Delaware is in the third in the conference and one game behind Hofstra for second in the conference. Plus, the team has three huge games coming up against Hofstra, Towson and Drexel. These games can all have an impact on seeding for the conference championship. An update to the list first published in January that details the athletes to watch this spring. The Delaware athletes to keep an eye on throughout 2019.